In what feels like an annual event, Star Trek Online is getting a new Executive Producer. Stephen Ricossa, aka Salami Inferno, is taking over command from Stephen D’Angelo. Who took over after Daniel Stahl left, both times, who took over when Craig Zinkievich, the original EP, changed rolls within the company. From interviews I’ve heard Ricossa is a huge Trekkie, something he also mentions in his first EP post, and I’ve been a fan of the way he communicates with the player community in his former Lead Producer role. Hopefully that doesn’t change now that he’s in the big chair. With the launch of Season 10 Sector Space will be comprised of only three maps, with each one representing a quadrant that exists in STO. Woot! This is something I’ve been wanting since the game launched. I’m a little apprehensive about the details as this will have to have a big impact on the chat and duty officer systems, but it will be so nice to be able to set a course and not have to worry about getting stopped at arbitrary walls within sector space. I’m also curious to see how exactly they split the sectors up into the three quadrants. Alpha and Beta quadrants have always been treated as one in Trek books/TV/movies. 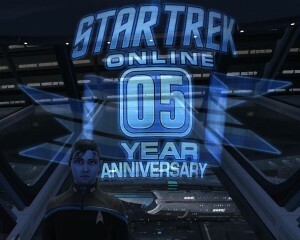 While the anniversary event started in-game last week, today is the day it actually launched five years ago (at least according to my calendar and STO Academy). The event includes a new episode Dust to Dust that does one of my favorite things: expands on plot lines from the television series. This one revisits Harry Kim’s complicated relationship with Jhet’leya/Lyndsay Ballad from the episode Ashes to Ashes. I won’t spoil anything about it, but it’s one of the best episodes that Cryptic has done yet and includes some great voice work by Garrett Wang and Kim Rhodes. The anniversary event has also finally gotten me out of my Kerbal Space Program rut and started me finally playing the Delta Rising expansion content. I think I am about half way through it, but I try not to look at the episode list to see since the mission titles might provide spoiler for me. The story episodes have been excellent, it’s been a real treat to hear Tuvok, Kim, Seven, Neelix, and the Doctor again. The patrol missions are fun although they pale in comparison to the story episodes. On their own though, they are fun, and a few notches higher in quality than the original patrols that were in the game the first few years. I’m particularly enjoying that the new enemies use more powers, really makes the fights more engaging. Speaking of engaging, I’ve only stopped playing through the missions for now because I hit a level gate, something that’s not happened to me since the first year I played the game. I probably would’ve hit one earlier had I not been messing around with Duty Officer assignments the last several months and so only started the DR content once I was about level 52. My next mission requires level 55 and I’m just a few hundred points shy of that now, so I’ll get back into the story line soon. I’m still trying to figure out my plans for remaining ships to upgrade to tier 5U using the free upgrade tokens I got, my current ship is a Vesta-class so that one was an easy decision to make. I also need to look at my equipment and decide what items I want to invest tech upgrades in. I usually get a serious case of analysis paralysis when making permanent decisions like that. So far though I haven’t felt a need to upgrade anything in order to complete the content. I always get excited for the start of a new year. It’s a good opportunity to take stock and attempt to get back on track. The first for me that’s meant for me this year has been getting back into my wood shop where I haven’t been in months and working on getting things cleaned up and ready for a project that I’ve been procrastinating on for about two years. I’m in dire need of more shelf space in my home office for all of the books and other stuff that I collect. When I originally started the project I got hung up on getting my plans drawn out and trying to make sure I had all of the cuts and raw materials figured out. This year I finally spent an evening learning Sketchup and finally managed to come up with good plans. If it’s the only thing I do all year, I’ll be happy if I finally have my office shelving project finished this year. I’m keeping the lists I made in last year’s resolutions and going to keep plugging away at them. The thing I learned from last year is I’m not good at rotating from one thing to the next. Instead I would read several books, then stop and read a ton of comics, and then stop and go back to video or board games. My goal this year is to stay more cognizant of what I’m spending my time on and not focus so obsessively on one thing at a time. One of the big things I regret not continuing was Fleet Nights in Star Trek Online. I really want to get those started back up, which means I need to get through some of the Delta Rising content to unlock some of the new events since that’s been the easiest thing to get a group together to do. Really the only thing I’m not looking forward to is new games. I couldn’t tell you what new MMOs are scheduled for release this year. There are a few non-MMO games that I’m looking forward to like Massive Chalice and Star Crawlers, but those are games I backed on Kickstarter and I’ve already be able to play early versions, so I don’t quite count those. Honestly, it feels pretty good as maybe I’ll finally get around to finishing a few games from my list-of-shame like the DLCs and extended ending for Mass Effect 3 that I still haven’t played. Several dev blogs have come out in the last two weeks that I’m just now catching up on. My favorite new feature has to be Grapple Guns! While I would love to be able to use these anywhere, I really doubt that will be the case. None of the existing maps will have been developed with the idea that players can move in three dimensions. I actually wonder too if even for maps where grappling is intended to be used if it will be something where it can be used on any surface or only against specific attachment points. The latter case would be much safer from a development standpoint, but I really hope it’s not that limited. Feign disintegration and get a short term stealth effect, speed bonus, and ambush bonus. Spawn a photonic decoy to draw enemy fire. Tag an enemy at distance and initiate a site-to-site transport to bring them to you and disorient them briefly. Fire an EM pulse probe that will travel towards a target disabling any intervening enemies and then explode damaging the target and any nearby enemies. Evade target locks to give a massive accuracy debuff against an enemy and become untargetable by enemy torpedoes and mines. Transport warhead will allow you to beam a torpedo directly onto an enemies bridge, bypassing shields and possibly knocking a system offline. These are just a few that I liked, there are eleven ground and eleven space abilities described in the blog. As primarily a Science Captain, these look especially fun to me. Of course reputations are a given with any expansion or major update to the game now, and Delta Rising is no different. 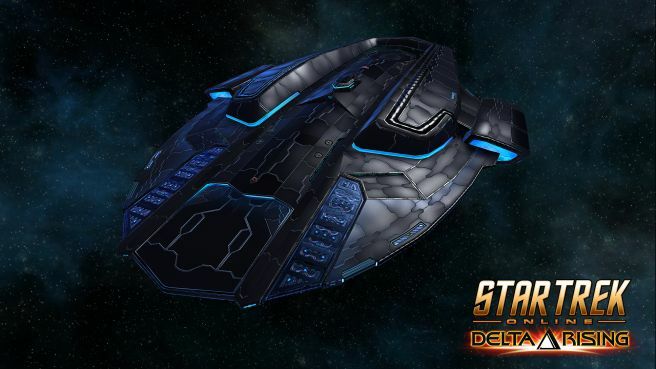 The Delta Alliance Reputation will be added with the expansion and bring Delta Marks as the basic reputation currency along with Ancient Power Cells for equipment unlocks (or getting bonus dilithium ore). The reputation offers a four piece space set called Delta Alliance Assault (engines, shields, deflector, and warp/singularity core), a three piece space set called Delta Alliance Ordnance (console, polaron beam array or heavy cannon), and neutronic torpedo), and a three piece ground set called Delta Alliance Elite (combat armor, unimatrix shield, compression phaser rifle). All gear is listed as Mark XII, which seems odd given that the new maximum gear level is Mark XIV. Possible typo? Nope. not a typo and there’s also a new Gear Upgrade System. So items will now have a leveling system called Tech Points. Once an item has enough to qualify for an upgrade a Basic, Improved, or Superior Tech Upgrade item can be used to upgrade it to the next Mark level. Basic Tech Upgrades will be available from vendors (or crafteD), while Improved and Superiors upgrades will be crafted only. Crafting recipes unlock at 5, 10, and 15 respectively, and the recipes won’t require dilithium. This seems to be intended to promote crafters putting them on the Exchange. The dilithium cost comes in when an upgrade is applied. Upgrades will use a similar slotting system to the revamped R&D system, so you’ll be limited to how many items you can upgrade at a time. Also the upgrade process will take a certain amount of real time to completed. It’s not mentioned but I assume you’ll be able to pay additional dilithium to speed that up just like you can with R&D projects. There’s also a Research Point track for items, which I wasn’t so clear about from the blog that allows bumping up an item’s quality (common to uncommon, etc.). That doesn’t seem quite as important as bumping the Mark level up, and seems like it over complicates things. Of course until it’s in the game we won’t really know. We’re finally starting to get some solid details about the expansion now. I expect Cryptic’s dev and PR arms to continue to get busier as we near the October release date. Yesterday, Cryptic posted a dev blog about the design process behind the ship design for the new Delta Rising ships. I’m not going to get into the whole debate of whether they’re Trek-like or not. That’s completely subjective. I will say I liked the thought process behind going for a visually cohesive set of ships designed around a set of themes. Of the three, I still like the tactical one the best. The nacelles look influenced by the Defiant design. I’m not totally sure about the swept back part, since I haven’t seen a side view, but it reminds me just a bit of Moya from Farscape which I’ve always loved. The blue lighting is great, although I prefer the grey hull material above to the dark material on the right. Unfortunately the science ship is still my least favorite of the three. It is nice to see that the open area in the hull can be filled in, having an open ring in the saucer section just doesn’t look good to me. My other issue is that the ship seems to be patterned after the Luna-class ships, like Riker’s Titan. I’ve never liked the extra science pod that sticks out on top of these, although I did eventually get used to it when I flew a Recon Science Vessel. So, it’s possible that the design of the new science ship will grow on me. Pictures are nice, but nothing really compares to seeing it in the game and the ship customizer. Sunday night was Fleet Night in Star Trek Online. I’ll be honest, I didn’t want to go. I had been playing Shadowrun: Crossfire all afternoon, and just barely losing, and I really wanted to keep at it until I finished a Crossfire mission. But it’s kind of bad when you don’t go to an event you’re organizing, besides having Fleet Nights was supposed to get me playing STO more regularly. So I logged in and figured if no one showed up then I’d go back to Shadowrun. Scopique and Ocho were already one though and Mindstrike, Talyn, and Warren all showed up as well, so we ended up having a pretty good night. We plowed through the Crystalline Catastrophe and Azure Nebula Rescue, and then Defera Invasion hard missions (which were slightly more bugged than in previous weeks), and then finished the night with Undine/Voth space battlezone. It was a fun night. Ocho was just coming back to the game after an absence and we kind of pulled him straight into the fire with us, but he did fine. So the Fleet Night experiment continues. For me at least, it’s doing exactly what I’d hoped by getting me to play more frequently. Last night was our second fleet night. It went even better as we had a full team of five and were able to run all of the Defera hard quests, Into the Hive, and the Voth ground battle zone. 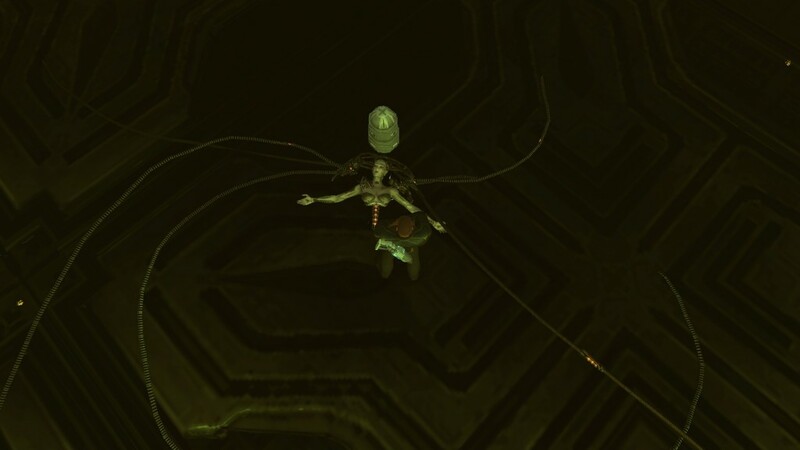 The Borg Queen gave us some trouble again in the Hive STF (normal mode still) but we eventually succeeded. We ended up playing from 9 until midnight, which made for a rough morning for me getting the boys up for school and daycare, but was totally worth it. We also added some Mercy Gaming members to the fleet. Warren joined us for most of Fleet Night, Jaren and Torek hadn’t unlocked access to the Dyson Sphere yet unfortunately. This is only the second organized night, but I couldn’t be happier with how well it went. I’m looking forward to playing Sunday night. Now if I could only remember to hit my Fraps hotkey to take screenshots. Three Dev Blogs! Ah! Ah! Ah! Cryptic release not one, not two, but three dev blogs today. The biggest news by far for me are the additional Voyager cast members doing voice work. Robert Picardo’s The Doctor was my favorite character from the series and I really hope he’s heavily used in the new content. In addition to Tim Russ as Tuvok and Garret Wang as Harry Kim, Jeri Ryan will be back as Seven of Nine (although I believe she goes by Annika now) and Ethan Phillips as Neelix. The second dev blog us about a new Space Event involving the conflict between the Borg Collective and the Cooperative. This one interests me more from the lore discussed in the dev blog than in thinking about playing the actual event. Seeing this contrast between two versions of the Borg is fascinating to me and I’m very interested to see where Cryptic takes it. The third blog outlines what Cryptic is calling the Delta Rising Operations Pack, which is the equivalent to the Legacy of Romulus pack that was released for the last expansion. At $125 it’s too expensive for me. I’ll wait an buy ships and equipment piecemeal like I did with Romulus. Despite that, there is some good new information in the dev blog regarding the new type of ship. The new type of ship will be called Intelligence. There will be three for the Federation, I assume in Tactical/Engineering/Science flavors, and one each for Romulans and Klingons. There will also be an additional Intelligence ship for each faction that is based on the theme of Voyager’s journey home. 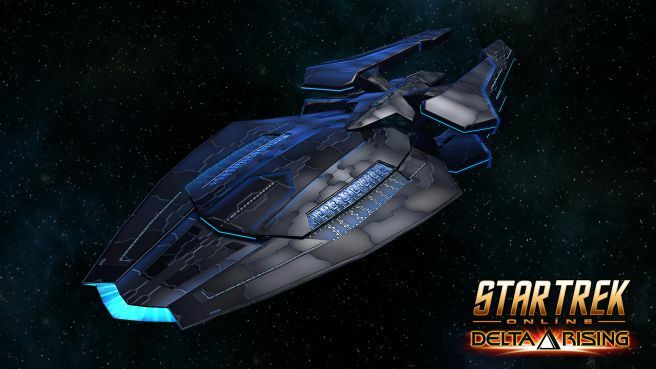 The blog mentions in passing that Intelligence ships will be able to launch drones to scan enemies for weaknesses which the Intelligence Bridge Officer can exploit through powers. This sounds to me like a combination of the current Science scan power plus the singularity powers that Romulan captains can charge up and unlock. The screenshots of the new Intel ships look really good. Unfortunately the Science ship is my least favorite of the three Federation ships. Hopefully that changes when I see it in game, sometimes screenshots don’t do these ships justice. Category: Rambles | Comments Off on Three Dev Blogs! Ah! Ah! Ah! Blaugust is over! Huge thanks again to Belghast for organizing this, it was just the motivation I’ve been needing. Also congratulations to the Survivors and other Winners. Star Trek Online is the only MMO I’ve really stuck with on a regular basis after hitting the level cap. That’s not to say I haven’t taken extended breaks from the game, which I have, but it’s the only MMO that I actually return to unlike LotRO and Champions which I want to play but never seem to actually login to. Unfortunately STO isn’t too popular among my circle of Internet friends, so I often log in do some stuff solo and log out. Our small Fleet of bloggers and friends generally only gets active in the months leading up to and following a content release. In an attempt to correct that a bit, I’m trying to push myself to organize some events, the first of which was last night. I’m hoping to make this a semi regular thing, depending on people’s schedules, to try and get the Fleet to be more active. Scopique from Levelcapped, Talyn from Pumping Irony, Mindstrike, and myself got together in-game last night and had fun queueing up as a team for half a dozen events. My favorite of the night was the Into the Hive task force. It had some great voice overs of the Borg Queen that really added to the atmosphere of the mission. I never seem to remember to take screenshots when playing games, I suppose I’m just too involved in the moment. Fortunately Mindstrike remembered and snapped this victory shot after we defeated the Queen. 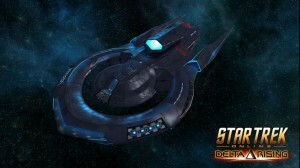 Yesterday Cryptic released the one dev blog a lot of people have been waiting impatiently for, upgrading Tier 5 ships. Upgrading is done via Zen through the C-store, for between $5 and $10 (subject to change as is all of the dev blog information). The upgrade is per ship but account wide, although I don’t seem many people flying the same ship on different alts. T5 upgrades are free for special ships, basically anything that came from a reputation event, the lobi store, or a lock box. 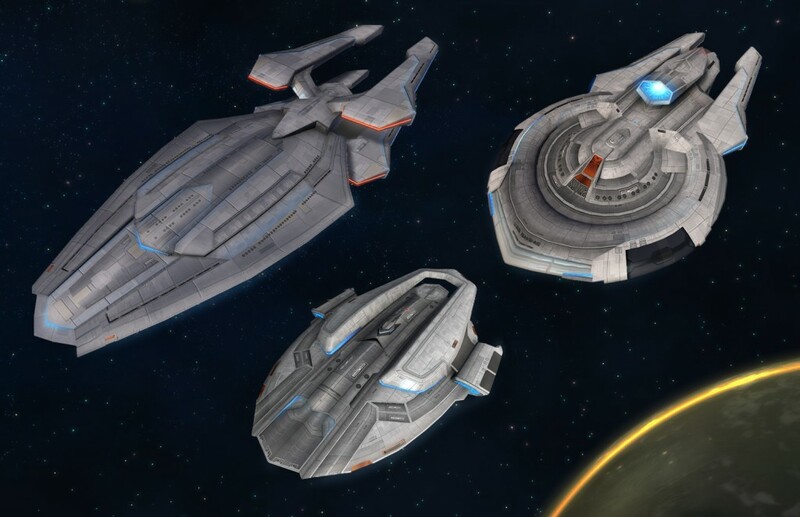 Upgraded T5 ships only have four levels unlike the five for T6 ships. Just like T6 though the ships will scale up their hull and shields as they level. Since they don’t have the last level that T6’s do, they cannot unlock a Starship Trait. Of course if you have a T6 and unlock a trait you can still use it while flying a T5+ ship. T5+ ships also won’t have specialist bridge officer seating. There’s a linked page with a list of all of the ships in the game along with whether they are upgraded for Zen for for free. What I found interesting about the page though was just seen how many ships are in the game now, and those are just the Tier 5 ships. Only the most challenging new level 60 content will strongly benefit from using an upgraded Tier 5 starship or a Tier 6 starship, however it will not strictly require it. The two bolded sections basically read to me that T6 ships will have an easier time, but are not required for any of the new content. For me, that means that I’ll likely stay with my current ship, a Vesta-class, unless I really like the look of one of the new T6 ships. Speaking of how many ships are in the game, add one more. 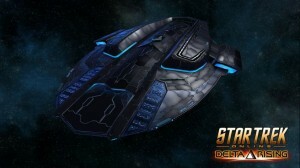 The Constellation class is being added to STO. The most well known example of this class being the USS Stargazer, Jean Luc Picard’s first ship. This is C-Store ship that adds a new skin to the Heavy Cruiser Refit, a Tier 3 ship, along with a new console called the Warp Burst Capacitor. This emulates the Picard Maneuver, which involves a ship performing short duration a high warp acceleration directly towards another ship causing them to appear in two places at once. The STO console gives a brief untargetable status, moves your ship forward a short distance, and gives you a short ambush attach bonus. The console is nice enough that I think a some players will pay the 1000 Zen, $10, just to get that. Then there’s the ship collectors and role-players who’ll want it too. The majority of the player base isn’t going to buy ships right now anyway given that no one’s likely to buy new ships until the T6’s come out with Delta Rising. Personally I’m tempted by the console, but I don’t think I’ll get it unless I come up with a build where I think it will be handy.